If the detrimental impacts of human-induced climate change continue to mount, technologies for geoengineering our climate – i.e. deliberate modifying of the Earth's climate system at a large scale – are likely to receive ever greater attention from countries and societies worldwide. Geoengineering technologies could have profound ramifications for our societies, and yet agreeing on an international governance framework in which even serious research into these planetary-altering technologies can take place presents an immense international political challenge. In this important book, a diverse collection of internationally respected scientists, philosophers, legal scholars, policymakers, and civil society representatives examine and reflect upon the global geoengineering debate they have helped shape. Opening with essays examining the historic origins of contemporary geoengineering ideas, the book goes on to explore varying perspectives from across the first decade of this global discourse since 2006. These essays methodically cover: the practical and ethical dilemmas geoengineering poses; the evolving geoengineering research agenda; the challenges geoengineering technologies present to current international legal and political frameworks; and differing perceptions of geoengineering from around the world. The book concludes with a series of forward looking essays, some drawing lessons from precedents for governing other global issues, others proposing how geoengineering technologies might be governed if/as they begin to emerge from the lab into the real world. 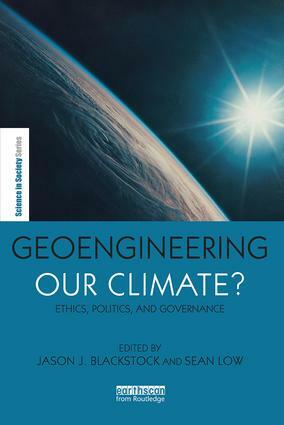 This book is an indispensable resource for scientists, activists, policymakers, and political figures aiming to engage in the emerging debate about geoengineering our climate. Can emergency geoengineering really prevent climate tipping points? What role for the most vulnerable? There’s no place like H.O.M.E. Is solar geoengineering a national security risk?